NARADA MICHAEL WALDEN and features 4 original songs. 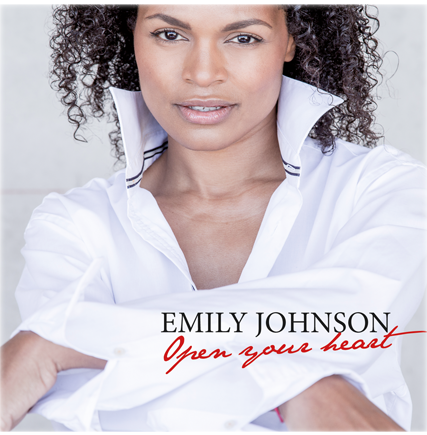 "Open Your Heart", Emily Johnson sings in her just released debut Album http://radi.al/EmilyJohnsonOYH. To her it’s more than words: it’s a way of life. She gives herself to the art with more than passion, she gives herself to her audience with a great generosity, energy and sincerity that have allowed her to ignore the prejudices, to erase borders, to overcome difficulties and then share with them the simple pleasure which is to SING! Emily has been fortunate to work with some of the music industry greats. Amongst those is the incredible guitarist, John McLaughlin, who invited her on stage for an emotional performance of Redemption Song. Another is the famous American producer Narada Michael Walden, who graciously opened the doors of his studio and offered her four of his compositions in which Emily is a writer. Today, this beautiful story continues with new collaborations, on both sides of the Atlantic, for the release of her first Album, simply titled “Open Your Heart”. An obvious choice, isn’t it?